I’ll be honest: I never really dug Guerilla Games’ Killzone titles. They never really lived up to the Halo-killer hype that accompanied them and never stood out from the FPS landscape in a way that, say, Insomniac’s Resistance games did. Killzone 3 didn’t get very high marks from me. But this waterlogged Killzone Trilogy will be getting some love from me. I was expecting this new release to come via FedEx. What I wasn’t expecting was a completely soaked package. You can see that the shrinkwrap didn’t offer up much protection. 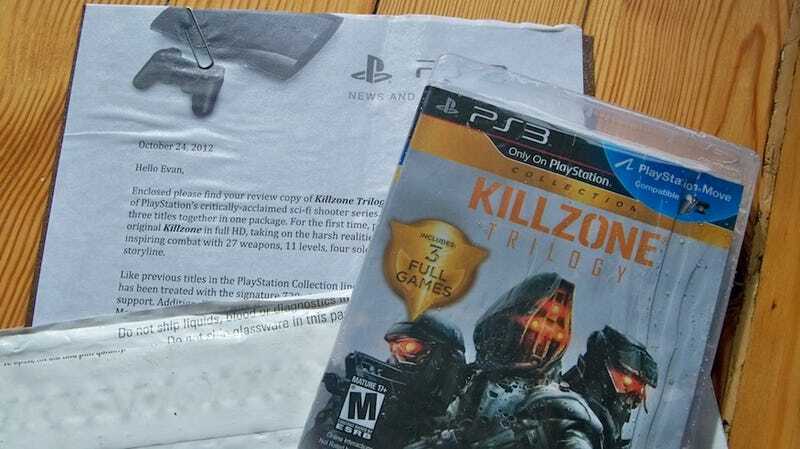 I don’t know the exact journey that envelope went through to get to me but I figure I should at least pop it into my PS3 to see if the Helghast survived the storm that devastated so much of the East Coast.